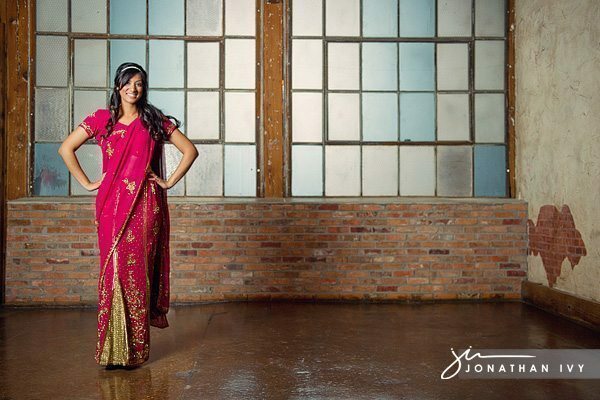 We are so excited to share with you all our first Indian bride here and Jonathan Ivy. And can I say, I don’t think we could have started with a more beautiful bride, both inside and out! Rebekah met us through Elizabeth with After Yes and we fell in love with her on the phone! She is such a sweet girl and we had so much fun shooting her bridal photos at the McKinney Cotton Mill one day along with friend, bridesmaid & florist Amy with AK Floral Designs. The gorgeous bouquet shown above and the stunning head piece to come were both designed by Amy with AK Floral Designs. LOVE the color of her Saree! Isn’t she beautiful? !